Cowabunga! To celebrate Nickelodeon premiering Rise of the Teenage Mutant Ninja Turtles, the network's brand-new 2D-animated series which reimagines the iconic characters of Teenage Mutant Ninja Turtles in a fresh new way, in September 2018, Nick USA will be airing the very first episode of Rise of the Teenage Mutant Ninja Turtles as a Turtley Awesome sneak-peek on Friday 20th July 2018 at 9:30 PM (ET/PT), following Nickelodeon's Kids' Choice Sports 2018 at 8:00 PM (ET/PT)! Update (7/14): Nickelodeon has announced in a trailer that they'll be airing the first episode of Rise of the Teenage Mutant Ninja Turtles commercial free! In the very first episode of Rise of the Teenage Mutant Ninja Turtles, "Mystic Mayhem", the Turtles discover for the first time that they are not the weirdest things in New York! Following the US airing of the sneak-peek, YTV in Canada will also air the first episode a week later, on Friday 27th July 2018 at 5:00 PM ET/PT! 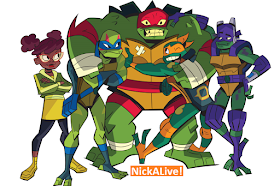 The Teenage Mutant Ninja Turtles return in Nickelodeon's upcoming Rise of the Teenage Mutant Ninja Turtles, a brand-new 2D-animated series which reimagines the characters in a fresh new way, slated to premiere in September 2018! Visit nick.com, YTV.com, the Nick App and the YTV GO app to find out more information. More Nick: 'Rise of the Teenage Mutant Ninja Turtles' Official NEW SERIES Theme Song | Nickelodeon! Originally published: Friday, July 06, 2018.